I am passionate about preserving our history, especially in the form of historic homes and buildings, sites of significance and memorials to individuals who impacted our history in a positive way. I have often said that I haven't yet chained myself to a building to keep the bulldozers at bay, but I suspect my tombstone may read: "I told you I wasn't going to let you tear that building down!" This was a great day at the Alice Robertson House. 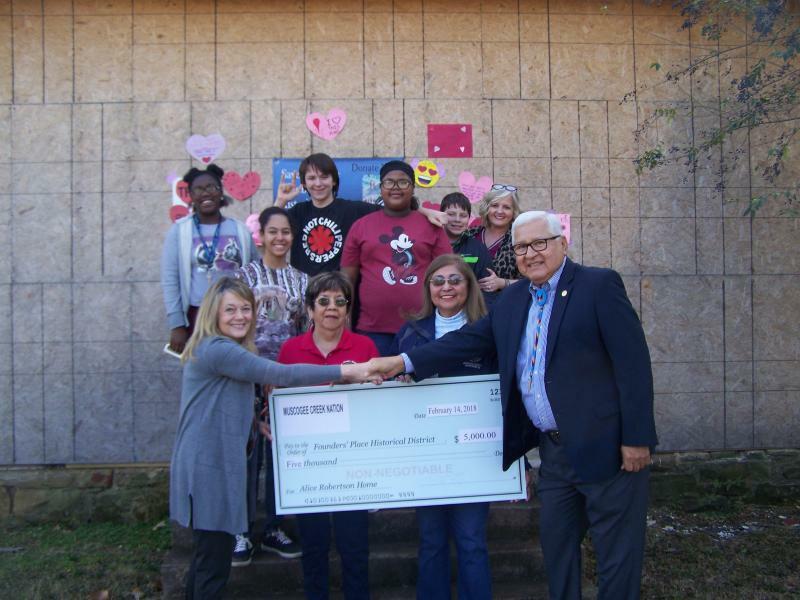 Students from Alice Robertson Junior High returned again this year to "heart bomb" the house to show their appreciation for it and the woman who lived here and gave her name to their school. In addition, officers of Founders' Place met with Muscogee (Creek) Nation councilors for a photo to thank them for their generous donation to the restoration. Work will begin almost immediately on the next phase of this project. 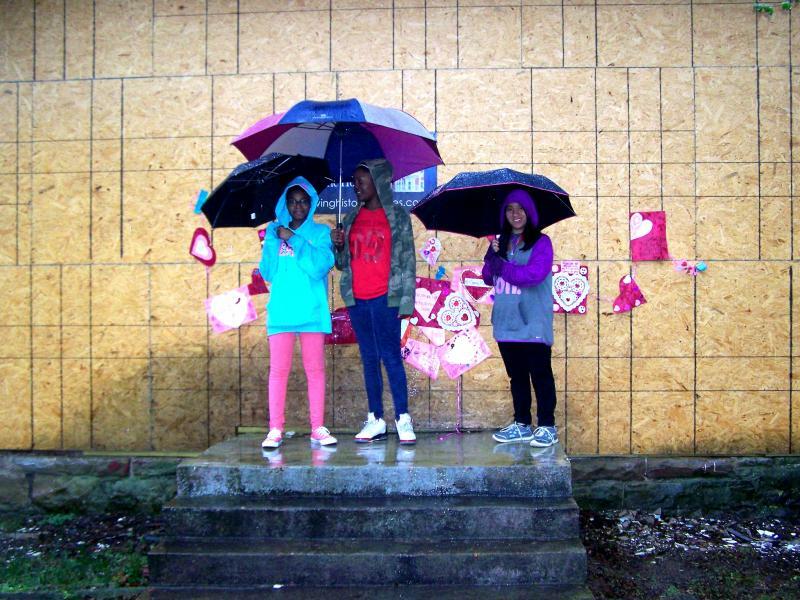 Sweet thanks to the students from Alice Robertson Junior High who "heart bombed" the house of Alice Robertson to show how much they care about seeing this house restored to honor such an amazing woman. One valentine read: "Love you, old girl." That's exactly how I feel about this house! Muskogee Tree Service donated the removal of a cluster of small trees growing way too close to the east side of the Alice Robertson House. Now the trees are gone and we'll be ready to start repair work on the east side as soon as we raise the funds. Visit savinghistorichouses.com to donate! Thank you Matt White and Muskogee Tree Service! The front facade of the Alice Robertson House has been repaired. All the termite damaged wood has been replaced. The door and windows will be framed in at a later date. For now the facade is covered with plywood to protect it from the elements and vandals. Thanks to Beck Construction for their fine work! Many thanks for Union Pacific Railroad for its donation of $1,000 to the Alice Robertson Home Restoration project. The students at Alice Robertson Junior High also collected $300 for this project. Located at 1109 Elgin in Muskogee, Oklahoma, this home was built in 1905 and occupied by Alice Robertson from 1925 until her death in 1931. Robertson was the first woman elected to Congress after women received the vote in 1920. From a significant family of missionaries to the Cherokees and Muscogees (Creeks), this remarkable woman was a pioneer and role model for women. Her home is in danger of demolition by the City and needs thousands of dollars in restoration efforts. Please consider a donation to the cause. There are several ways you can give. Good news! The University of Tulsa (founded by Alice Robertson) has pledged a $50,000 Challenge Grant to this worthy project. 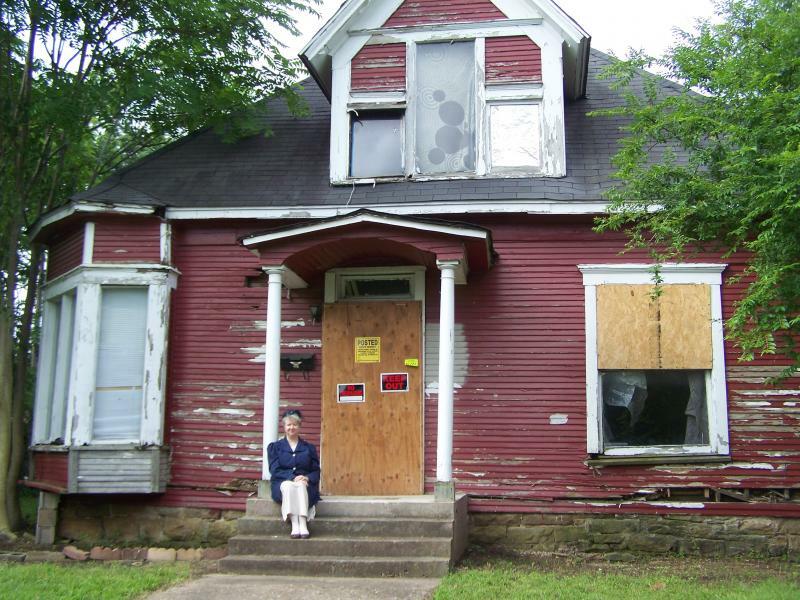 Now Founders' Place and Muskogee's Neighborhood Alliance for Historic Preservation must raise a match of $50,000. Please give today to help us out. If 2000 generous folks gave $25 each we would quickly have $50,000. Visit the website savinghistorichouses.com to donate through PayPal. Or give the historic way. Make checks payable to Founders' Place Historic District and mail to P.O. Box 3827, Muskogee, OK 74402. Copyright 2019 Jonita Mullins. All rights reserved.